Pictured: From left are Eversight's Carrie Wolverton, Dean Jack D. Sobel, M.D., Linda Hazlett, Ph.D., Elizabeth Berger, Ph.D., Shunbin Xu, M.D., Ph.D., and Eversight's Colleen Vrba. Representatives from Eversight Center for Eye and Vision Research, an international network of nonprofit eye banks with global headquarters in Ann Arbor, Mich., traveled to the Wayne State University School of Medicine on Aug. 31 to present certificates for three Eye and Vision Research grants totaling $55,000 to the Department of Anatomy and Cell Biology Distinguished Professor and Chair Linda Hazlett, Ph.D.; Assistant Professor Elizabeth Berger, Ph.D.; and Associate Professor Shunbin Xu, M.D., Ph.D.
Dr. Hazlett will use her grant to test the hypothesis that glycyrrhizin, which is extracted from licorice root and possesses numerous pharmacological effects, can improve antibiotic effectiveness against multi-drug resistant corneal infections. "I'm appreciative of the awards given today, both as a principal investigator and as vice dean of Research," Dr. Hazlett said. "These awards remain integral to our efforts here at Wayne State University and support data collection which will lead to R01 submissions within the year." Dr. Berger is investigating a protein - thymosin beta 4 (Tβ4) - that can be used in tandem with ciprofloxacin to more effectively treat bacterial keratitis, a serious infection of the cornea that can cause blindness if left untreated and is often associated with contact lens usage. Dr. Xu is investigating inherited retinal diseases, which affect more than 200,000 Americans and millions more worldwide. His team is examining micro-ribonucleic acids, or miRNAs, that can play important roles in diseases when they are defective. The researchers and School of Medicine Dean Jack D. Sobel, M.D., attended the presentation. 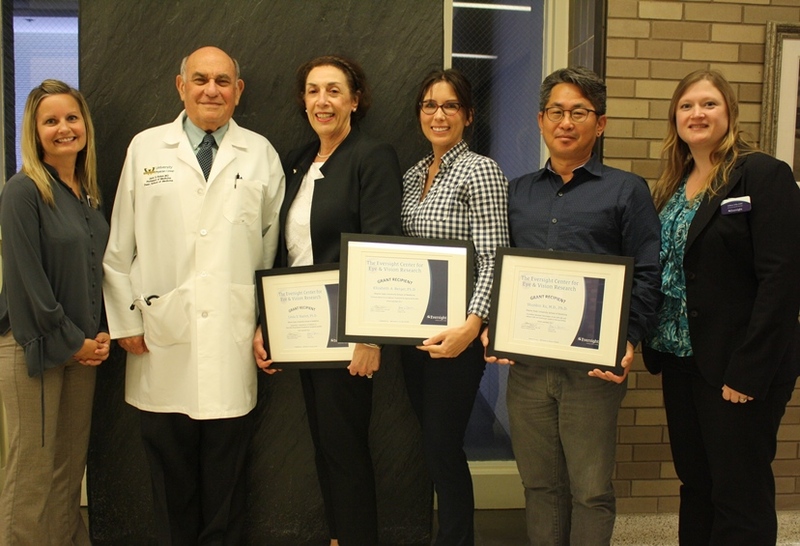 The gathering served to recognize the longstanding partnership between Eversight and the School of Medicine, which dates to 1955, while also celebrating the work of the trio of distinguished Wayne State researchers, said Eversight Partner Relations Manager Carrie Wolverton. Eversight has many ties to Detroit, the university and its Kresge Eye Institute. It provides many of the whole eyes and much of the ocular tissue for research and education at WSU. It also recovers and prepares corneal transplant tissue for most KEI and WSU transplant surgeons, and has provided regular research grant funding since 1980. "We are truly honored to support this research, which directly relates to the Eversight mission of restoring sight and preventing blindness," Wolverton said. "Through the years, Dr. Hazlett and others at Wayne have served on our Board of Directors, on advisory councils, as Eversight medical directors and as peer reviewers for our grant applicants." The Eversight Center for Eye and Vision Research is the one of the only eye bank-led programs focused on providing scientists with innovative resources they need to find new cures and treatments for blinding eye conditions. For more information, visit eversightvision.org/research.